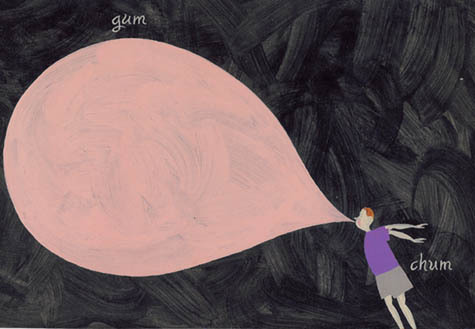 I love your pictures – especially the bubble gum blowing girl. How did you get the heading you have at the top? Some themes on WordPress allow you to change or upload the header picture to whatever you desire. I took the picture that you currently see as my header, and I uploaded it to the header position. Here’s how you can do it: Under your Dashboard, go to “Appearance”, and click on “Header.” That page allows you to upload an image, or select a default picture. This made me laugh for a few reasons. First, I have done something similar myself. 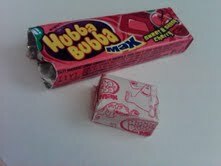 It wasn’t Hubba Bubba, but Bubbalicious. I never chew stuff like that and only really chew gum if I need to (onion breath!). However, one time I was standing in line at Target and I saw the pack’s pink wrapper glistening at me on the aisle rack. It was as if it was saying “hello, remember me? I’m your childhood!” So I bought it. I’m a sucker for marketing and the pink colors combined with the bubble writing of the word Bubbalicious was just too juicy to leave behind. So, alas I bought it and ate it. Problem is, it tasted like Crapola (note the capitalization). Secondly, I laughed at your post because I think in a way we look at this stuff (all the bad food we ate as kids) and think about our childhood, and in some crazy way we try to recreate that, or reclaim a bit of the past – and it never works. The irony is, when I was a kid I spent a great deal of time wishing I was an adult…doing adult things. I was so excited the first time I tried wine. Then when I did (parents gave me a sip or something boring like that) it tasted like Crapola! Sound familiar?Same thing just flipped. Funny.